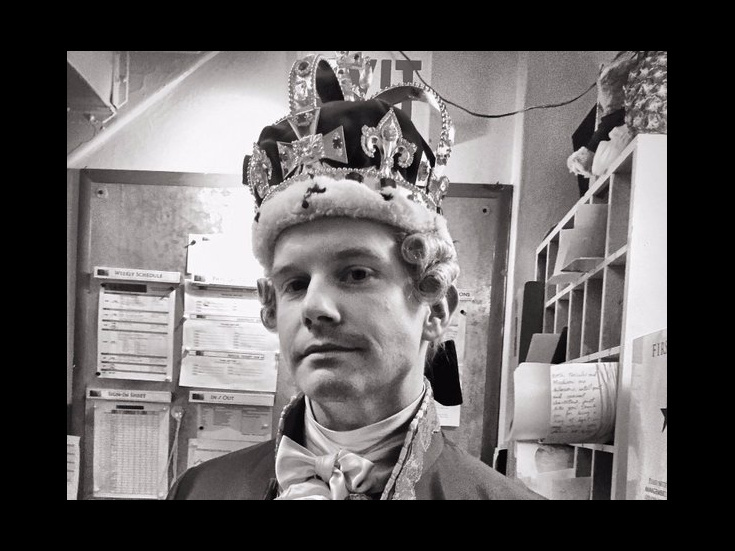 Rory O'Malley became the fourth man to don His Majesty's robes in Hamilton on April 11, replacing Jonathan Groff. As we all know by now, there's an official garter ceremony to mark the occasion of a new king ascending the throne, and today's #Ham4Ham broadcast O'Malley's. It doesn't disappoint—even former monarchs Brian d'Arcy James and Andrew Rannells (via FaceTime!) turned up. Check out the fun video of the coronation of King George III the Fourth at the Richard Rodgers Theatre below. Tony season is in full swing! Aladdin’s Adam Jacobs, Courtney Reed and James Monroe Iglehart will announce the 2016 Drama League Awards Nominees on April 20 at Sardi’s. As previously reported, She Loves Me’s Zachary Levi and Broadway bombshell Megan Hilty have been tapped to host the 82nd Annual Drama League Awards on May 20 at the Marriott Marquis Times Square. Meanwhile, Broadway alums Matthew Morrison and Vanessa Williams will announce the Drama Desk nominations at Feinstein's/54 Below on April 28. As we already knew, the 61st Annual Drama Desk Awards ceremony (which Hamilton can't sweep) is scheduled for June 5 at Town Hall, hosted by Michael Urie. Mark Rylance has most definitely become Steven Spielberg's muse. We reported only yesterday that the three-time Tony winner will work with the legendary filmmaker on The Kidnapping Of Edgardo Mortara, and now The Hollywood Reporter writes that Rylance is in talks to appear in Spielberg's sci-fi movie Ready Player One. Rylance just won the Oscar for Spielberg's Bridge of Spies and will soon be seen in his new flick The BFG. Just as long as it doesn't prevent the talented thespian from returning to the New York stage this fall, then all this is to be celebrated!—we found Rylance first, Hollywood! The CW's Crazy Ex-Girlfriend's season finale is on April 18 and we have a sneak peek below of what the musical comedy has in store...a certain Tony winner Lea Salonga! Starring Rachel Bloom and Tony nominee Santino Fontana, the cult favorite has already been renewed for a second season.